This is a typical exam question, and I've seen some very helpful posts about, but I still have a lot of doubts. With IC1’s I’ll have to make a RAM memory with 8 addresses, 8 bits each, indicating the memory’s CS (Chip Selection) line. 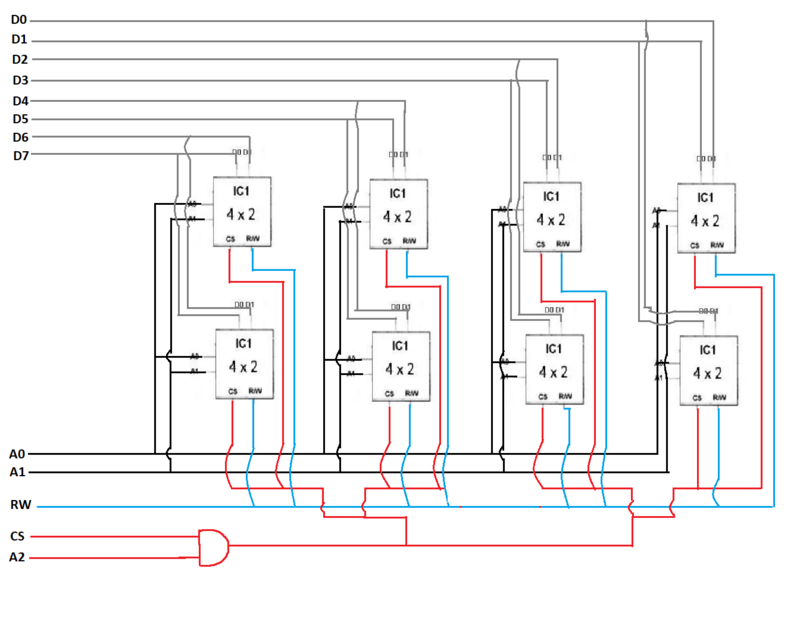 So far what I can figure out from this is that IC1 has 4 cells, or addresses, and each one can hold 2 bits. 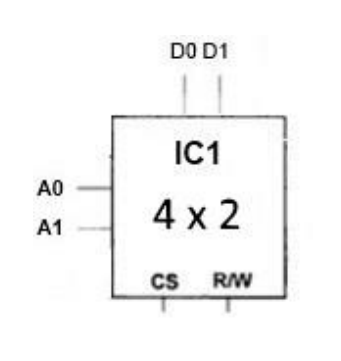 So if I need 8 addresses that would mean I need to have 2 IC1's, but then they wouldn't hold enough bits, meaning that I need two more (using only the data pins)? I'm very confused on how to make these designs, as I never had the chance to build any in a lab scenario. I hope someone can give me some hints or show me how these chips could be connect to make the desired memory. I'm not looking just for the answer to the example because I'll have to build other RAM's with different chips. You need two banks of four chips. The four chips in each bank simply have their A0, A1, CS, R/W signals connected and their D0/D1 connected to D0/D1, D2/D3, D4/D5, D6/D7. The CS signal of each bank has to be calculated by a logic using the external CS and the external A2 signal. Two AND gates and one inverter. These are all pointers you need. After all the tips everyone gave me, and brushing up on circuit building, this is what I've come up with. I chose to place the chips in a different order to ensure I knew what I was doing and not just copying the last question. Not the answer you're looking for? Browse other questions tagged digital-logic integrated-circuit design memory ram or ask your own question. How big variables are stored in RAM memory? 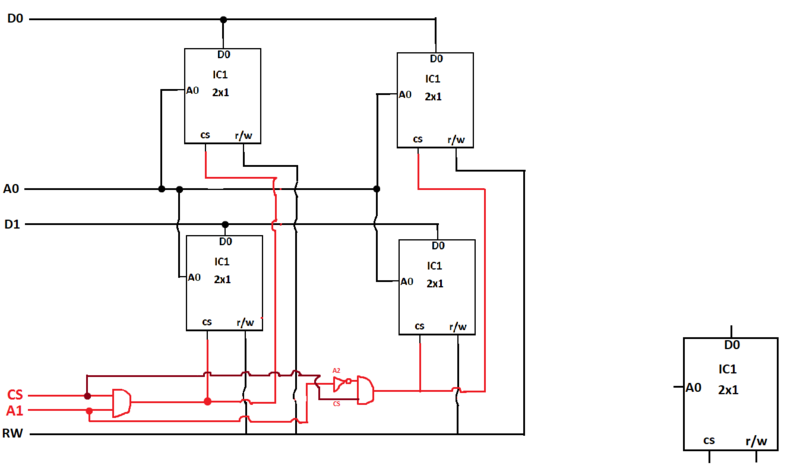 Professor said my embedded system design is incorrect, what did I get wrong? Difference between a memory cell and a memory chip? Increase ram ic memory cell count by using many ic? Memory chips, are the bits of a long word stored contiguously?